It’s hard to justify training in a dark gym when the sun is still shining outside. Especially since you can build muscle just as effectively using your own bodyweight as you can by lifting some iron. All you really need is something to push or pull on, and a little open space where you can move your body and activate all the muscles you’re used to training indoors. We came up with a plan you can do at your local park (or in the prison yard—hey, we won’t judge) to get you ripped and strong while improving your tan at the same time. How it works: Our program of wide-open spaces, plus the equipment that’s generally found around parks and children’s playgrounds. You’ll do pullups and dips (a jungle gym will work for these if you don’t have bars) with a descending rep scheme—start at 10 reps and do one less every set down to one rep. 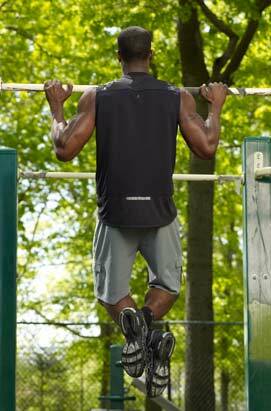 This is one method those guys you see working out in parks all the time use to blast out scores of reps at a fast clip. 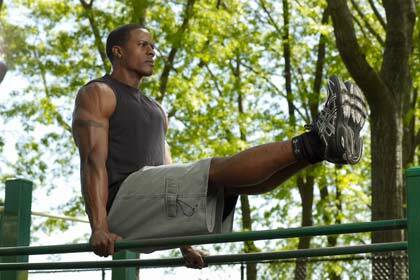 You’ll also do fun bodyweight exercises that you probably haven’t tried in years, such as bear crawls and crab walks. Though it may look like you’re playing, you’ll feel these exercises work your entire body, particularly your core, and you’ll tire out fast. 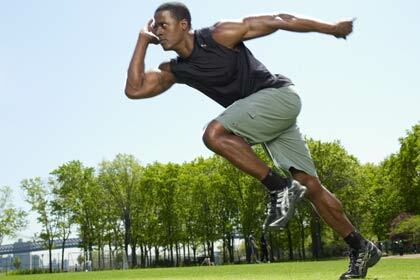 In fact, you may find these workouts so tough you’ll be grateful to go back indoors to the iron in the winter. How to do it: The exercises on Day 1 are performed as a circuit. Complete each set with minimal rest. On Day 2, exercises marked “A” and “B” are done as supersets. Complete one set of A, then one set of B; rest, and repeat until you’ve finished all the prescribed sets. Perform the remaining exercises as straight sets, completing all the sets for that move before going on to the next. If you can’t perform all the given reps for a set, do as many as you can without going to failure, rest as needed, and continue until you finish that number. Sets: 10 Reps: 10-1 Stand in an athletic stance with knees slightly bent and feet shoulder-width apart. Squat down until your thighs are parallel to the ground and then jump as high as you can. Land with soft knees and repeat. Perform 10 reps, nine, eight, and so on for each successive set until you finish with one rep.
Sets: 10 Reps: 10-1 Hang from a pullup bar, jungle gym, or tree limb and pull yourself up until your chin is higher than your hands. 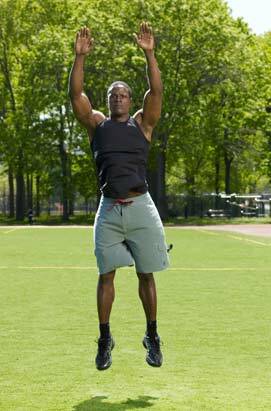 Perform 10 reps down to one rep as you did for the jump squat. If you can’t perform the prescribed reps, do as many as you can and perform one less on ensuing sets. Sets: 10 Reps: 10-1 Suspend yourself over parallel bars and then lower your body until your upper arms are parallel to the ground. Perform 10 reps down to one rep as you have been doing. Sets: 3 Reps: Crawl for 50 feet. Bend down and plant your hands on the ground. 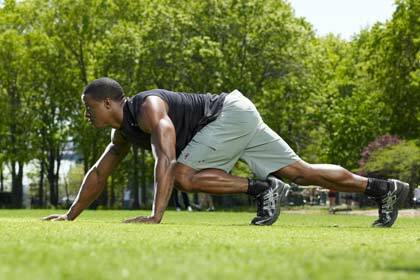 Try to keep your back flat as you crawl forward like a bear as fast as you can. Sets: 3 Reps: Crawl for 50 feet. Sit on the ground, and bridge up with your hips so you look like a table top. Walk forward on your hands and feet as fast as you can. Sets: 5 Reps: Walk to the end and back. Hang from a jungle gym or length of parallel bars. Walk to the end of the row and back with your hands. 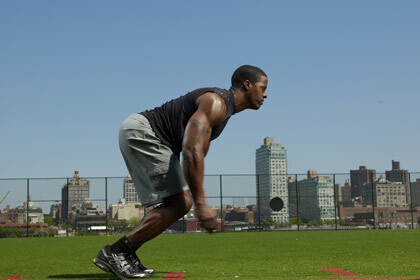 Sets: 5 Reps: Sprint 50 Yards. Run at about 90% of your top speed. Sets: 3 Reps: 10 From a standing position, bend down and touch your hands to the ground. 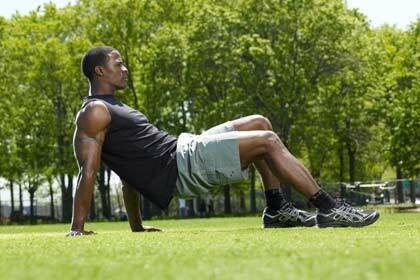 Now shoot your legs out behind you fast so you end up in the top position of a pushup. 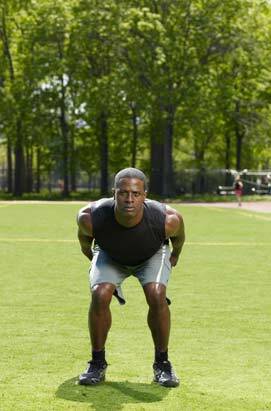 Perform a pushup, and then reverse the motion quickly and come back up. Immediately jump forward as far as you can. Sets: 3 Reps: 10 Perform a dip and then raise your legs straight out in front of you as high as you can. 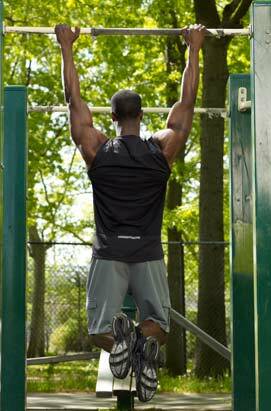 Sets: 3 Reps: 10 Perform a pullup and then raise your knees up as high as you can.